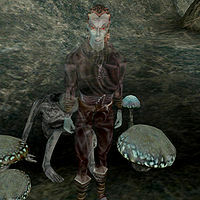 Idrenie Nerothan was a Dunmer mage who fought against the Akaviri during their invasion of Morrowind. She once took refuge with the Ashlanders, who told her about the Nerevarine and Dagoth Ur. She died trying to loot Kogoruhn and became one of the failed Incarnates in the Cavern of the Incarnate. She gives the Nerevarine a master's lockpick and a master's probe. Greeting — Welcome, Incarnate. I am Idrenie Nerothan. I was not the one. But I wait and hope. Ask, and I shall tell you my story. my story — I lived in the late years of the Tribunate, and behind the scenes, I helped us demoralize, then repel the Akaviri invaders. I knew nothing of the Nerevarine or Dagoth Ur until I took refuge with the Ashlanders. I died a fool, trying to loot ruined Kogoruhn. Here. Take these. Maybe there's something in the world left worth stealing. This page was last modified on 27 September 2018, at 18:23.